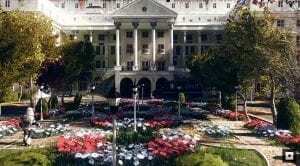 The Greenbrier appears in Fallout 76. Fallout 76 is a role-playing video game played out in West Virginia, though in an alternate timeline in which much of the world had been annihilated by nuclear war. Many locales in the game are based on real-world locations in West Virginia, which has been renamed “Appalachia” in the game. Developed by Bethesda Game Studios and published by Bethesda Softworks, it is the ninth game in the Fallout series and serves as a narrative prequel. The action in Fallout 76 takes place in A.D. 2102, twenty-five years after the ruinous conflict. Withing the game, each player’s character has been a resident of Vault 76, a fallout shelter built in hills east of the Ohio River to house the nation’s best and brightest minds. The character exits the Vault on “Reclamation Day” as part of a plan to re-colonize a wasteland. Fallout 76 is Bethesda’s first online multiplayer game, in which players may play individually or with a party of up to three others. Elements of previous Fallout games will be present and modified to work with the real-time game. The game will feature an open world four times the size of that of Fallout 4, which was based in an alternate Boston, Mass. The West Virginia game-world is called “Appalachia” and features many real locations as well as monsters, including Mothman, the Grafton Monster, and the Flatwoods Monster, which were inspired by West Virginian folklore. David Sibray, publisher of West Virginia Explorer, confirmed after a meeting with developers at The Greenbrier in October the locations of many West Virginia sites within the Fallout 76 game, and reiterated that he believed the game would have a significant impact in West Virginia. “I think that we’re going to see a situation in which possibly a generation of people, and maybe more than that, continue to gain a knowledge about West Virginia, and become attracted to it because of this game,” Sibray said in an interview with WBOY-TV.